As the nation has never heard of UCG I have undertaking research into Commercial Industrial scale "Underground Coal Gasification" (UCG) which the UK government is currently rolling out across the UK - this despite the fact after recent extensive trials in Australia (using world leading trial technology) - the Queensland government banned commercial UCG just last year because it is still unsafe and the only EU trial (part funded by DECC) ended in disaster and despite the dangers and no companies having any UCG experience a licence is up for grabs (for companies who have absolutely no UCG experience) - in Easington, Durham. Page 2 has maps with grid co-ordinates for the licenses. I've written the first draft of an article I hope to get published very soon, but I would prefer if the people of Easington approved the article first - if a councillor in the area could let the people know and ask for their approval for me. 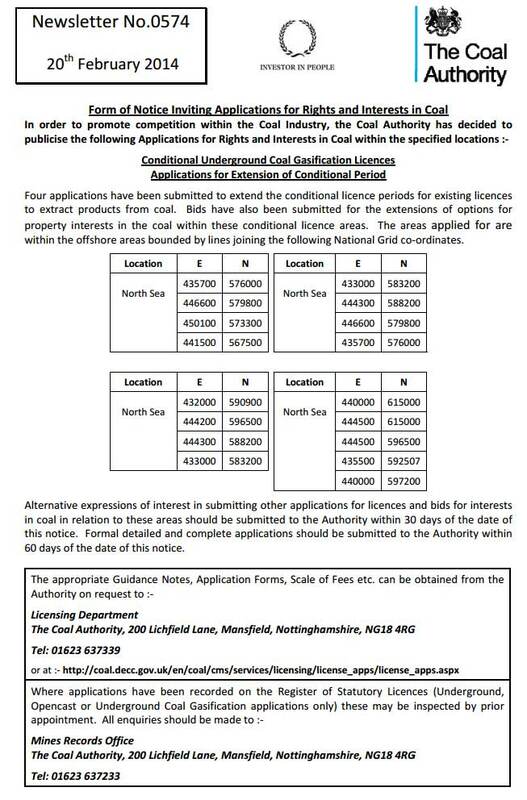 UCG is the biggest secret of the coalition government - and now Easington has been secretly targeted - the licence was made available for private bidders on 20th February 2014 - with bidding closing 60 days later, i.e. next month - not one company bidding for the licenses have any UCG experience. I quickly published two articles on UCG on the Open Democracy Website due to the concerns my initial research threw up. I have attached this comprehensive report into UCG - to allow the elected officials and the People of Durham, and especially the people of Easington and the surrounding area to read this report in advance of this Easington area UCG license being snapped up by a UCG company which has no UCG experience - to steal the rights and interests to billions of tons of coal in Durham - and allow you all to decide what you think of government plans for underground coal gasification in the area - being rolled out without your knowledge right now. Now we know why Thatcher shut our mines - with the full intention of stealing public assets (coal) for the benefit of only the 1% in the future. I have attached my report into UCG (in word and PDF format) as well as the article on Easington and a copy of the UCG license for Easington area. I have been forwarding my report to councillors, MPs and MSPs in the other areas where UCG licenses have been issued and politicians in these areas are up in arms now they realise what the government and these inexperienced UCG companies are up to without consulting the nation. I hope you find this information of use - to empower the elected officials of Durham and the people of the Easington area to decide their own fate - rather than the coalition and a few corporate companies. With my highest regards to the people of Easington and Durham. I live in Ayrshire, which is also steeped in Coal Mining History - my area is on the UCG map too - but as yet no license has been issued to date. DECC estimates there are 300 years of ON-SHORE coal suitable for UCG - with geologists estimating a further 1000 years of NEAR SHORE coal reserves available (on shore and near off shore licenses are being issued now). David Cameron and the 1% understand the value of 1300 years of coal reserves - that belong to the nation - this coal makes North Sea Oil look like mere short term pocket money - which is why they are transferring all the rights and interests to the British Nation's coal reserves now - purely for the future profit for the 1% - to ensure we continue to face austerity while the share out the future prosperity before we realise what is going on! That's why it's a big secret. To date - it is only taxpayers money that is being used to set up the new secret private UCG industry - so if it's taxpayers money surely it should be a Nationalised Industry for Public Profit - if it could be made safe? The expert academics at Newcastle's university are meant to warn us - but instead they have been bought off. Then the government gave their private company (set up with taxpayers money) a license for 2 billion tons of coal - with the right to extend to at least 10 billion. And then the government announced not so long ago taxpayers will underwrite £1 BILLION to build a gas plant to process the gas from the UCG license - and the private company gets all the profits - while the taxpayers pay all the debt. Now that sounds like a public industry to me - as it has been funded totally with public money - former and current Newcastle University UCG academics - who are meant to warn us - are now rubbing their hands at the future personal wealth to be had from joining in - while before they investigated the dangers - now their new publicly funded private company claims on it's website “UCG poses no threat to the environment or the climate"! 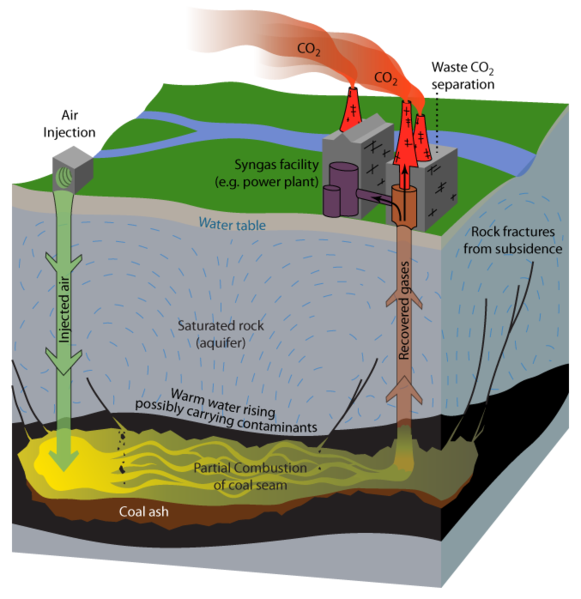 And remember - there can be no UCG industry in the UK - without the British Nation's coal reserves - but the nation has to receive no profits, no benefits - just the costs, the pollution and the misery this totally unsafe industry (which no one in the world is yet commercially rolling out - except in the UK). While George Osborne gets headlines for giving a few miners a few bags of coal - there is nothing in the press regarding Cameron giving away 100's of billions of the nation's coal free to the 1%. Why not? Because by rights the profits from the nation's coal should go to the exchequer and shared with the nation - but instead we are to gain no benefit at all - as they lay the foundations for the massive new private coal and gas industry (using taxpayers money) - with 23 trillion tons of NEAR-offshore (i.e. right up to the beach) and on-shore coal to be burned for 50 generations of profit for the families of the 1% only. The dangers to our health, water supplies, environment and climate are horrendous.